“I Am She Whom Drives The Jackals From You While You Sleep”, Rochester, USA. Fath47 “Lion” for Wall-Therapy from evan schapp on Vimeo. MAUS Urban Art Festival at Soho Málaga (Spain) from LatramaLab on Vimeo. Kilmany-Jo Liversage, aka Orda, is a Cape Town based artist who uses spray paint and acrylic paint to create portraits with a graffiti look and feel. Her portraits aren’t really about people, rather about recognising common ground in those we don’t know. DALeast is a Chinese born artist that lives and works in Capetown, South Africa. The 29-year-old, who keeps his real name a secret, has been making art since he was three. His unusual paintings, which are sometimes hundreds of feet across, look three dimensional and appear to have been created out of thousands of tiny metal shards. He has tagged walls on nearly every continent, from Cape Town, Melbourne, New York and London, as well as his native China. MANDELA GRAFFITI time laps painting from ben jay crossman on Vimeo. During the Los Muros Hablan Festival in Peurto Rico last year (2013), several artists including Conor Harrington, Jaz and SA’s Faith47 took some time to visit the dangerous, crime-ridden area of La Perla. They painted new murals in this strangely beautiful district, outside of main street art event. LA PERLA from TOSTFILMS on Vimeo. A Swiss winery’s graffiti and street art project. FAITH47 - myFINBEC 2012 from Rebild Productions on Vimeo. WALL\THERAPY 2012 - FAITH47 - I AM SHE … from WALLTHERAPY on Vimeo. 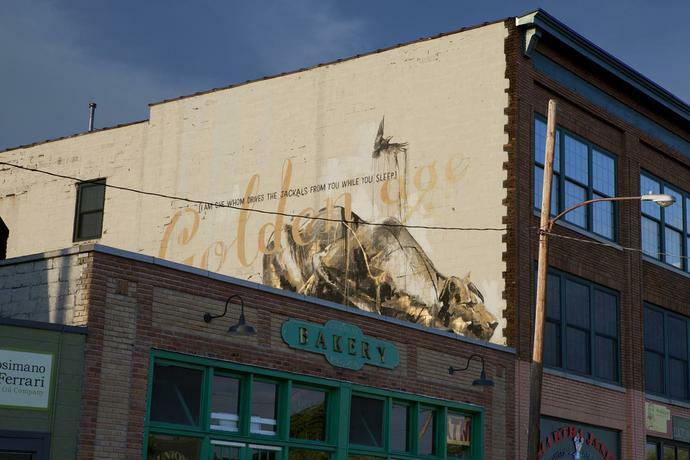 Painted in Rochester, 2012 as part of the Wall Therapy event. Graffiti Fine Art from Jared Levy on Vimeo. 65 graffiti artists from 13 countries descend upon São Paulo, Brazil for the 1st Biennial International “Graffiti Fine Art” Exhibition. In an art world where semantics matter, graffiti artists from around the world wonder what exactly is ‘Graffiti Fine Art’. After all, once graffiti leaves the street… is it even graffiti at all? A documentary by Jared Levy. 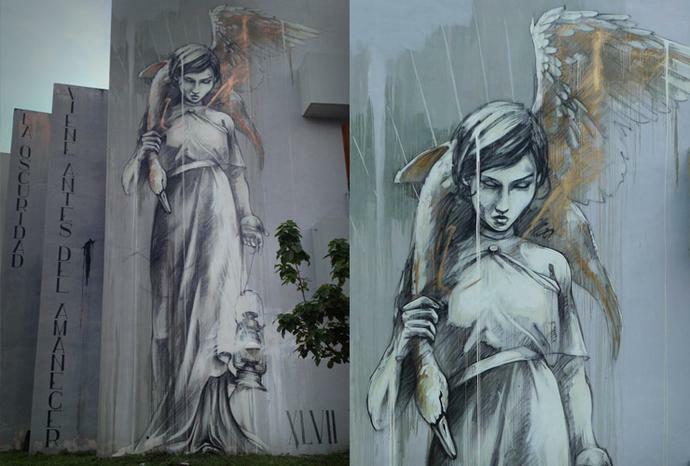 featuring SA street artist Faith47. Wall Therapy from Rosanna Bach on Vimeo. Part V - Living Walls Conference 2013 from Living Walls: The City Speaks on Vimeo. Documentation of Nuart Festival 2103 featuring work from Martha Cooper, M-City, Dal East, Roa, c215, Vhils, Faith47, Ernest Zacharevic, Dot Dot Dot, Aiko, Dotmasters, David Choe, Martin Whatson, Hush and Strøk. NUART 2013. SHOWTIME from NUART on Vimeo. YUL murals (Faith 47, Omen, Ricardo Cavolo, Jasper Wong) from DestinationYUL on Vimeo. DALeast - Discount Evolution (full version) from Jeff Coles Smith on Vimeo. DALeast - Discount Evolution (short version) from Jeff Coles Smith on Vimeo. 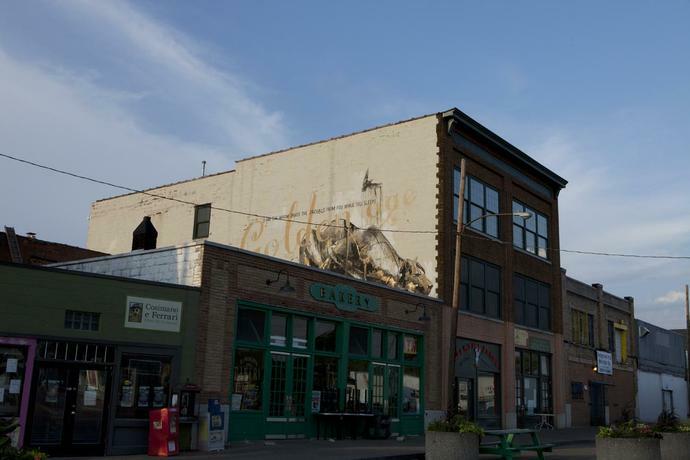 Painted at WALLTHERAPY 2012, the followup to Rochester, New York’s 2011 VISUAL INTERVENTION. Wall\Therapy 2012 Trailer from Ian Wilson on Vimeo. Talking Graffiti with Ivan Miller from Charlie Stemen on Vimeo. Filmed and Edited by Charlie Stemen. Introducing another new strain to the ever growing Spraying Bricks channel, the KREW series. To start this series off is a collective that emerged on the scene in 2008, 40HK. Consisting of Artists INKFETISH, JASIK and POER. There are 14 members of 40HK in total with heads based in Norway, New Zealand, Melbourne, South Africa, London and Kent. 40HK stands for forty hit combo from the classic video game Mortal Kombat Vs DC Universe a statement on their out of this world style. Spraying Bricks joined the crew as they embarked on their biggest wall to date. Situated on Leonard Street opposite the creative den that in the Book Club and the famous Pure Evil gallery, the guys have a prime spot in the heart of Shoreditch, accompanying artwork from the likes of STIK. The mural is heavily based on the theme of the 70’s and 80’s TV show RAINBOW and with the influence of graffiti fused with characters they have created a truly colourful and amazing piece. I AM SHE WHOM DRIVES THE JACKALS FROM YOU WHILE YOU SLEEP - 2012 from FAITH47 on Vimeo. 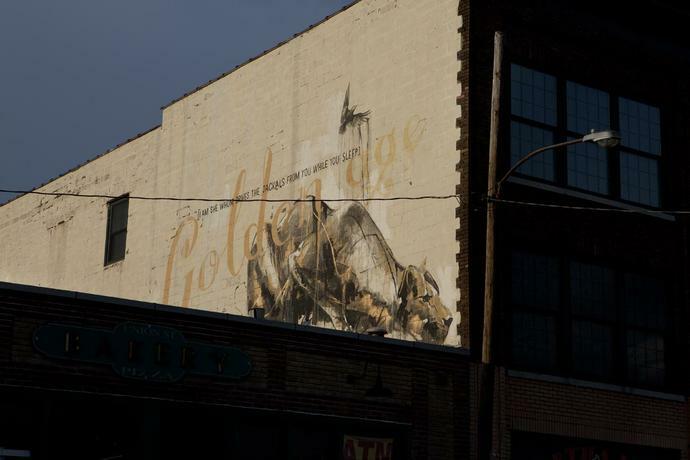 Painted in Rochester, NYC in 2012 as part of the Wall Therapy event. RHAPSODY - ROCHESTER, NYC - 2012 from FAITH47 on Vimeo. ‘Rhapsody’ was completed for the Wall Therapy mural project based in Rochester, NY in 2012. “Dafen International Mural Invitational Exhibition” is an art event organized by Shenzhen Pavilion in the World Expo in Dafen. The 25 artists (teams) invited come from all around the world including Alexandros Vasmoulakis and Woozy from Greece, Hitnes and Run from Italy, Faith 47 from South Africa, ECB from Germany, Shok from the UK, Toast from Switzerland, The Bogside Artists from Northern Ireland and IDT from China. Open Walls Baltimore was curated by Gaia and featured artists from around the world including Interesni Kazki, Maya Hayuk, Swoon, Specter, Doodles, Jaz, Ever, Freddy Sam, Mata Ruda, Nanook, MOMO, Vhils, Sten and Lex, Chris Stain, Jetsonorama, Overunder and others. Check out more of his pics HERE. Find out more about their trip to U.S.A HERE, and watch a video of the mural they painted in New York City HERE. A short video documenting Wesley van Eeden and Paul Senyol’s artist residency at Pro Artibus in Finland from May - June 2011. 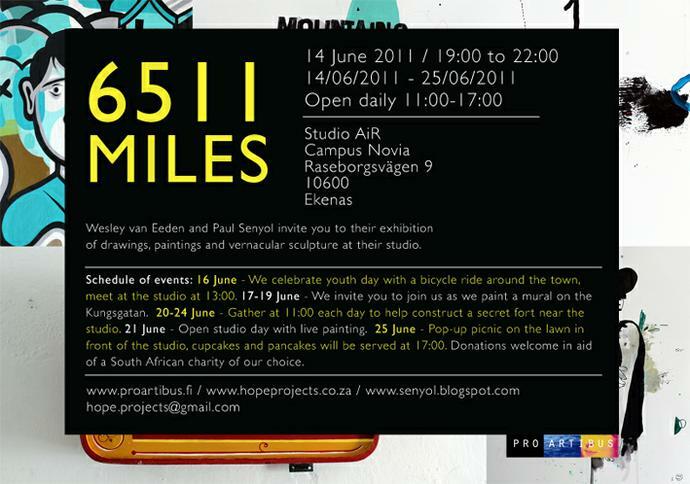 6511 Miles from Wesley van Eeden on Vimeo. Also, check out some of the artworks HERE and HERE. BELIEVE/Visual Intervention from Ian Wilson on Vimeo. Featuring Cape Town artists Faith47, Dal, Freddy Sam and Mak1one painting in America with other local artists.